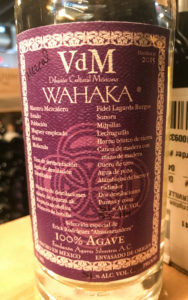 While Wahaka produces many fantastic mezcals that are more readily available, the Wahaka VdM line is some of the hardest to find and most expensive mezcal on the market. The name VdM stands for “Vino de Mezcal,” which is an old name that was used for agave-based spirits before Mezcal and Tequila were considered individual spirits categories. Most Wahaka mezcal is made by Alberto Morales in San Dionisio Ocotepec, Oaxaca (read about our visit to his palenque), however Wahaka VdMs are from a variety of different producers who live in remote locations throughout Mexico. 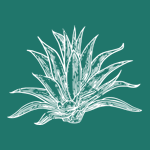 They are produced using vastly different techniques, and they vary greatly in the types of agave that are used to produce them. These are all highly artisinal, small-batch creations. The Wahaka team scours the most remote regions of Mexico to find and bottle these incredible mezcals for sale in the US. Through their VdM label, they’re able to promote a wide variety of production methods and different mezcal-producing regions. VdMs are not certified Mezcals, so they don’t follow the restrictions that may limit other Wahaka releases. Given the scarcity and demand for these highly prized bottles, we wanted to see if they were really worth the hype (spoiler alert: they are!). For this tasting, Tyler and I were joined by our fellow Mezcalerbro, Joseph, who’s helped us with a few other tastings like our Blind Tasting: Mezcal de Pechuga. 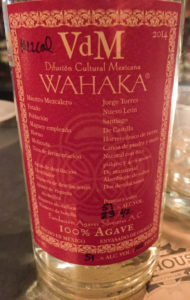 We’d heard rumors that The Pastry War, an infamous mezcaleria in Houston, had all the Wahaka VdMs ever released. We visited to investigate further. In total they had eleven different VdMs on the shelf, with several backups of many of the bottles. Our information from the Wahaka owners tells us that they’ve released a total of twenty-three VdMs over the years. So The Pastry War didn’t have all of them, but they had more than we’d ever seen in one place. We’ve also heard that Teote in Portland, Oregon has all the Wahaka VdMs ever released. Perhaps we’ll make a special trip to the Pacific Northwest to visit them soon. Do you know a mezcaleria with a lot of Wahaka VdMs? Let us know in the comments below and we’ll visit them the next time we’re in town. 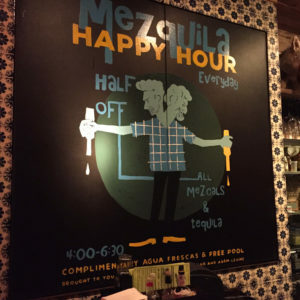 Don’t let the name of The Pastry War fool you; they serve no pastries, but they do take the cake for best happy hour in Houston, which includes half off all mezcals from 4-6:30pm every day. Sarah and Krista were behind the bar the night we visited. They were both super knowledgeable about all things agave and Sarah showed us photos from her recent trip to Oaxaca with Del Maguey. 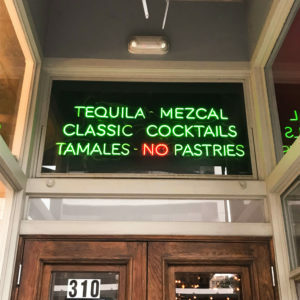 Krista informed us that The Pastry War is named after the first Franco-Mexican War (1838-1839), which was marked by the famous ransacking of a bakery in Puebla. In addition to the incredible happy hour deals, they also make the best Michelada in Houston. If you ever visit The Pastry War, make sure to swing through Anvil as well. It’s a short Lyft ride from The Pastry War and serves some of the best cocktails in H-town. 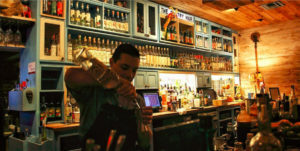 Both establishments are owned and operated by Houston’s “King of Cocktails” Bobby Heugel. The Penca Verde was made by Valentin Celis in Zimatlan, Oaxaca using agave Penca Verde. The agave was cooked in an earthen pit, milled by hand with a mallet, and double distilled in clay pots with river water. There were 132 bottles of this released in 2014 at 47% ABV. All three of us agreed this was one of our favorites of the night. The Arroqueno Ensamble was made by Jose Lopez in Miahuatlan, Oaxaca with agave Arroqueno, Madrecuixe, and Cuixe. The agave was cooked in an earthen pit, milled by tahona, and double distilled with well water in copper stills. There were 90 bottles of this released in 2015 at 47% ABV. The Espadin Vidrio was made by Justino Rios Martinez in Zoquitlan, Oaxaca with agave Espadin. The agave was cooked in an earthen pit, milled by tahona, and double distilled with spring water in copper stills. After distillation in 2007, this mezcal rested in glass for eight years before being released in 2015. There were 90 bottles released at 51% ABV. The Ixtera Amarillo was made by Macario Partida Ramos in Zapotitlan de Vadillo, Jalisco with agave Ixtera Amarillo. The agave was cooked in an earthen pit, milled with rollers, and double distilled with river water in copper stills. Released in 2014, there were just 48 bottles at 48% ABV. The Azul Telcruz was also made by Macario Partida Ramos in Zapotitlan de Vadillo, Jalisco. This mezcal, however, was made with agave Azul Telecruz. The agave was roasted in an earthen pit, milled by rollers, and double distilled with river water in a copper and wood still. There were 48 bottles of this mezcal released in 2014 at 48% ABV. The Espadilla was made by Asuncion Matilde in Zoyatla, Puebla with agave Espadilla. The agave were roasted in an earthen pit, milled by hand with an ax, and distilled once in a still that was made of clay and oak with copper coils. There were 90 bottles released at an ABV of 48.5%. The Papalote was made by Artemio Garcia Barrios in Tlacotenco, Guerrero with agave Cupreata. The agave were cooked in an earthen pit, milled with a wooden mallet and ax, and double distlled with river water in a still that featured a wooden shell with a copper pan. After distillation, this mezcal spent one year en vidrio before being bottled for distribution. There were 132 bottles released in 2014 at 51% ABV. All three of us agreed that this was one of our favorites of the night. The Cupreata Borrego was produced by Moises Calzada in Chilapa, Guerrero with agave Cupreata. The agave was cooked in an earthen pit, milled with rollers, and double distilled with river water in a copper and wood still. Before the second distillation, lamb meat was added to the mezcal. This mezcal came in at 48% ABV. There were 90 bottles released in 2015. The Verde was made by Marcelino Perez in Malinalco, Estado de Mexico with agave Verde. The agave was roasted in an earthen pit, milled with a stone pedestal and wooden mallet, and double distilled in a copper still. There were 50 bottles released in 2014 at 49% ABV. The De Castilla was made by Jorge Torres in Santiago, Nuevo Leon with agave De Castilla. The agave was cooked in an earthen pit, milled with stone and wooden mallets, fermented in wood with 60% pulque and 40% mosto and double distilled in a copper still. There were just 42 bottles released in 2014 at 51% ABV. This was also on all of our lists as one of the favorites of the night. The Lechuguilla was made by Fidel Lagarda in Milpillas, Sonora with agave Lechuguilla. The agave was roasted in an earthen pit, milled by hand with an ax, fermented in a leather sack, and distilled in a modified truck radiator. There were 114 bottles of this released in 2015 at 48.8% ABV. 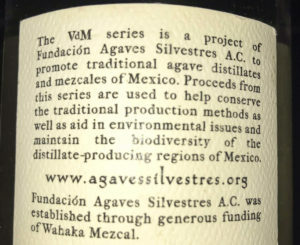 The front label of this bottle states that it was bottled from Almamezcalera and we suspect that some of the other VdM mezcals may come from that source as well. This one helped us close the night strong as all three of agreed this was one of our favorites. The big question we hear a lot about Wahaka VdMs is related to cost. Most of the bottles we’ve seen fall in the $200-$250 price range. So why are they so expensive? For starters, you’re paying for incredible, one-of-a-kind mezcal. Secondly, proceeds from Wahaka VdMs benefit the Fundación Agave Silvestres, a non-profit organization that is dedicated to the reforestation of wild agave in Mexico as well as the protection of traditional agave distillation and production methods. Tasting these incredible spirits back-to-back really gives you an idea of the scope and variety that is possible in mezcal, and we highly recommend trying some of these VdMs if you get a chance. We especially enjoyed the Oaxaca – Penca Verde, Guerrero – Papalote, Nuevo Leon – De Castilla, and Sonora – Lechuguilla. Do you have a favorite Wahaka VdM that you’ve tasted? Let us know in the comments below. The Sonora-Lechuguilla is easily the most interesting, unique, and “different” mezcal I have ever tasted. Each time I taste it I like it more and more. 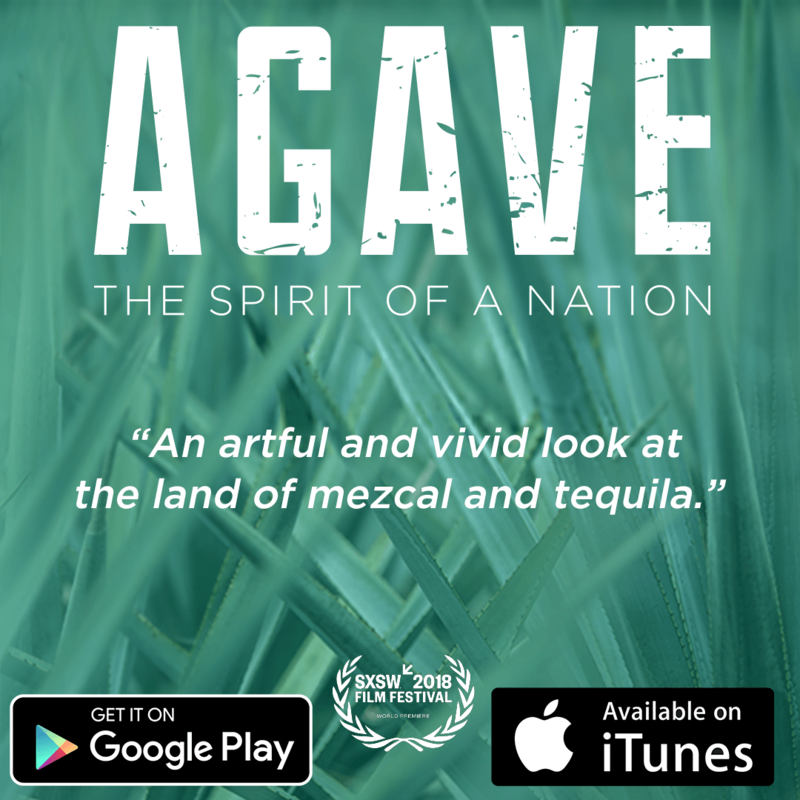 Well worth the high price tag, especially when know that part of the cost is going to the preservation of wild agave and the tradition of single farm mezcal production. Thanks for the in detail write up!! – The number of bottles per VdM variety can be a little deceiving — this is the actual number of bottles that we were able to export. It doesn’t necessarily reflect the number of bottles per batch. In some cases, Erick bottled some himself for sale in Mexico and so on. We don’t have an exact number of liters per batch across the board so decided to use this number instead.